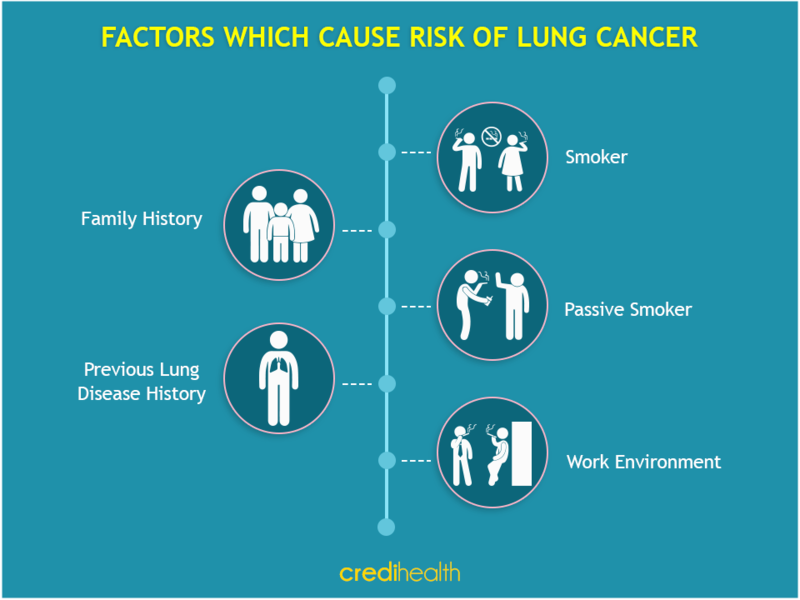 Blog » Health Blog » Cancer Section » Are you at risk for lung cancer? Being positive for a lung cancer risk factor means that the person is more likely to develop this particular cancer. However, it does not necessarily mean that you are bound to get the disease – It is probable that many people who actually develop this cancer may not even check positive for a single risk factor. It is still helpful to know about the various factors that affect the development of cancer in the lungs. Some factors can be controlled, for which precautions can be taken; there are others that a person may have no control over, like a family history of this cancer. Smoking is a lifestyle habit that greatly influences a person’s chances of developing cancer in the lung. The risk factor increases with the number of cigarettes smoked each day and years since the person has been smoking. Quitting at any age, regardless of how long a person has been a smoker shows immediate positive effects on the lungs and a lowered cancer risk in the long run. Being in the company of smokers or in a smoke-filled atmosphere exposes a person to second-hand smoke. This essentially means that even passive inhalation of smoke can cause the negative effects that a smoker experiences, increasing the risk of cancer. Working at certain places, having particular occupations or being part of certain industries puts these people at a higher risk of developing cancer in their lungs as compared to others. This is known as an occupational exposure, as people come in contact with such chemicals only if they work around them for long hours. People who already have a family member like a parent, child or sibling suffering from this cancer have an inherently higher risk of developing the disease themselves. This is supposedly linked to a gene mutation that gets passed on in a family. The risk is higher if the family member developed cancer at an early age. People who have recovered from lung conditions or diseases may have certain scars that get left behind on which tumours can develop. Tuberculosis, chronic obstructive pulmonary disease (COPD) and Chlamydophila pneumonia infections increase the risk towards cancer. Can something be done to prevent risk for lung cancer? Call +91-8010-994-994 and talk to Credi Medical Experts for FREE. Get assistance in choosing the right cancer specialist, compare lung cancer treatment cost from various hospitals and get support in managing other hospital processes.